Watch photos! Watch a video! 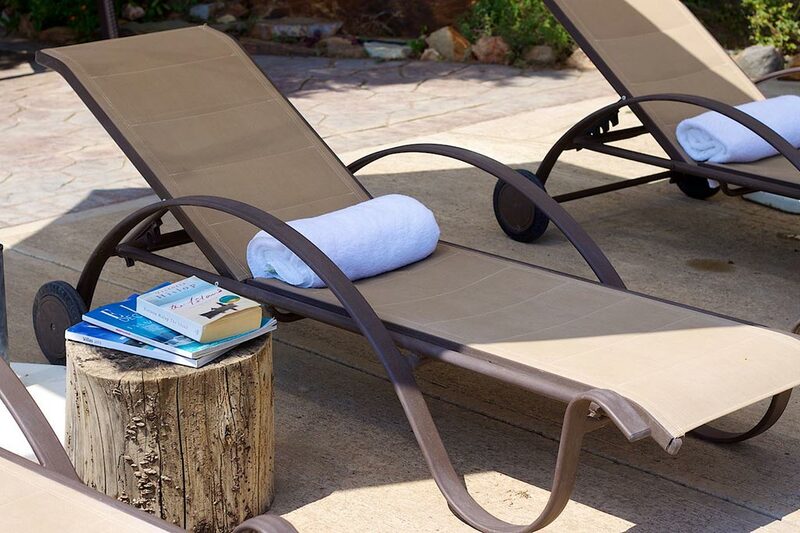 - Its location allows you the opportunity to relax under natural shade. 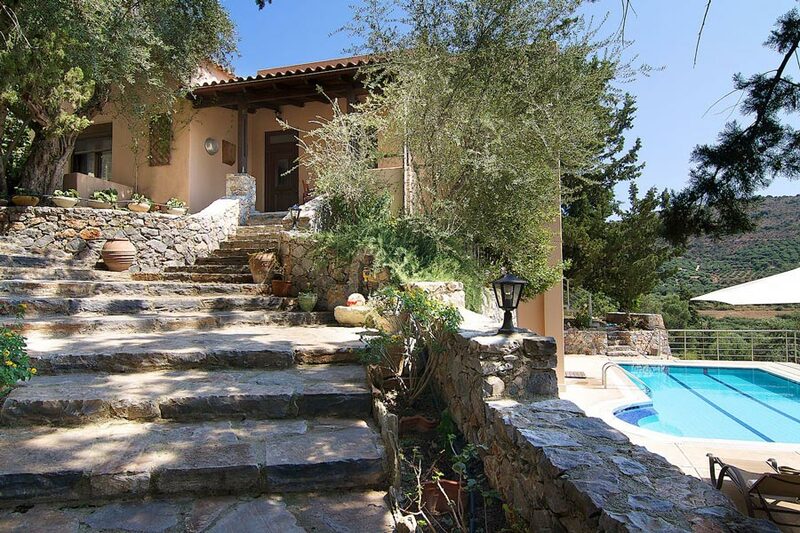 - It offers full privacy to the guests and has a perfect layout for families with children! 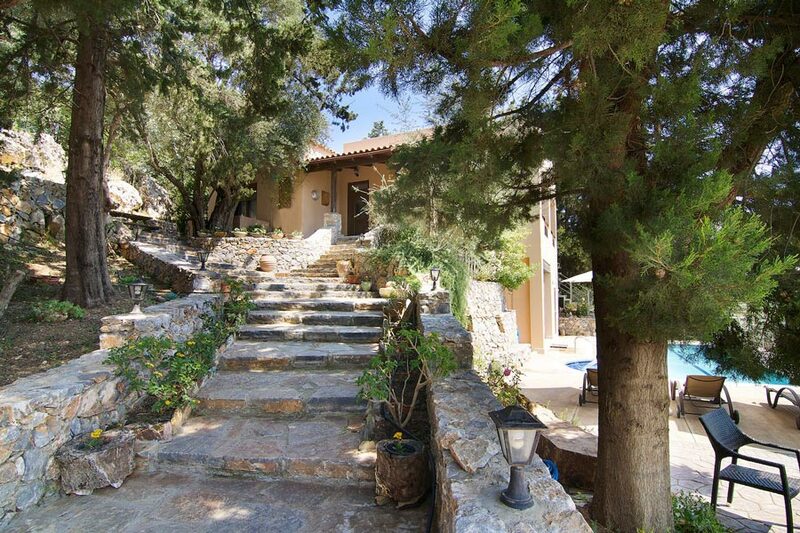 - The location is “away from it all” in a totally natural environment but close to everything! 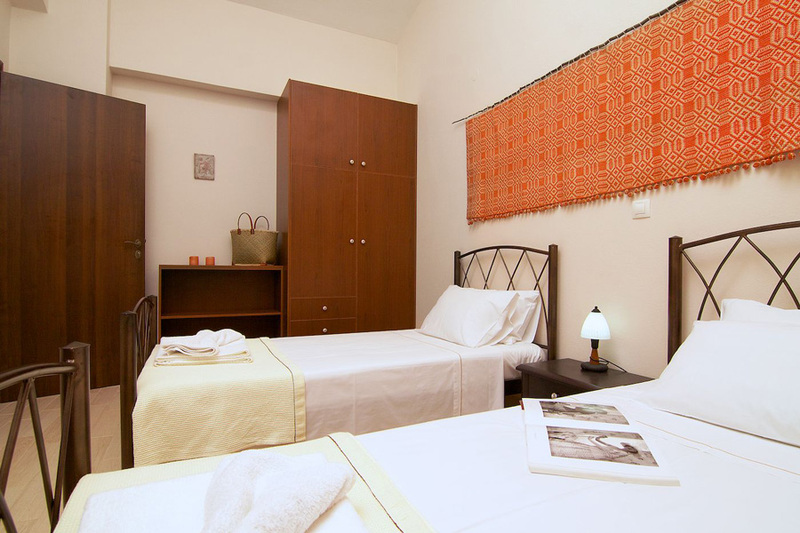 - Easy access for visiting both the Chania and Rethymno areas, also for sightseeing and beaches. - The unique barbecue and dinning area under the trees! 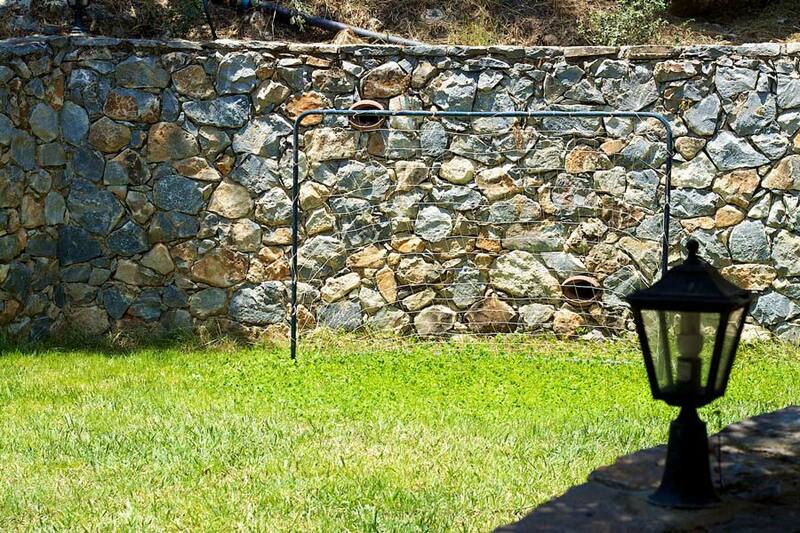 - The vegetable garden which you can use during your stay! 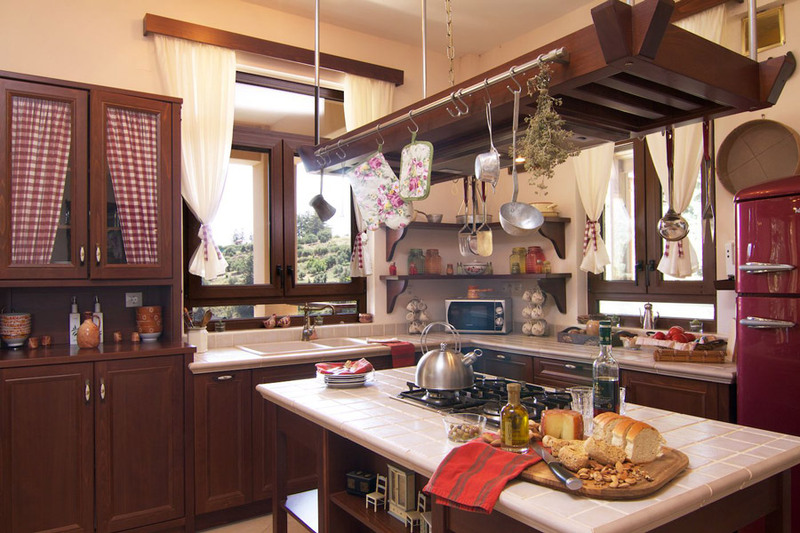 - The rare traditional design and antique utensils that you will find inside the villa. 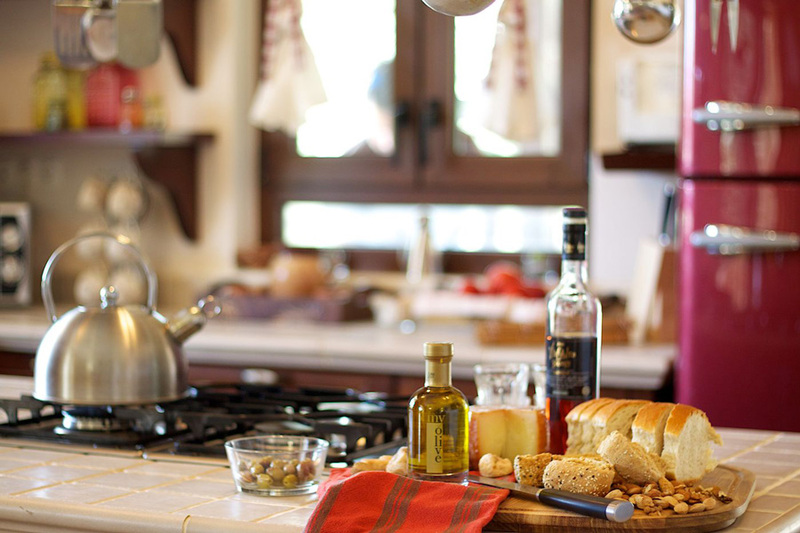 - The hospitality of the owner and his family who will help you with everything and be there whenever needed. 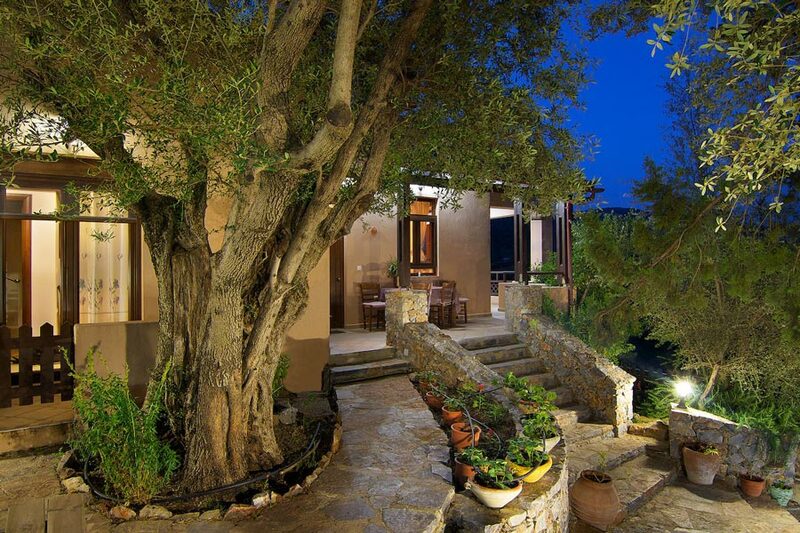 The Villa is approved by Greek Tourism Organization with license number: 1042K91002977801. At the rear of the villa and shaded by some trees you will find the barbecue, a vegetable garden and a grass covered children’s playground. An enchanting sitting area in the forest, next to the garden creates a relaxing environment and will delight our guests. 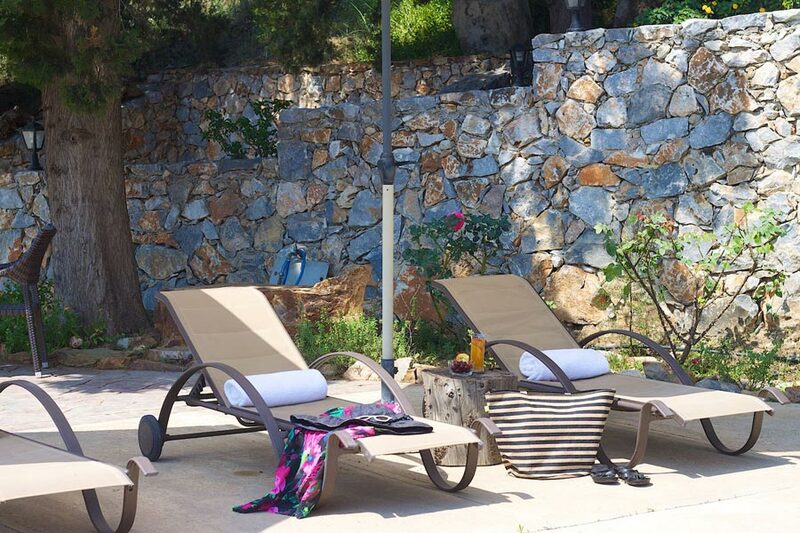 Here you will find a 40 m² private swimming pool with 4 sun beds, 4 pool side tables and 2 large umbrellas! 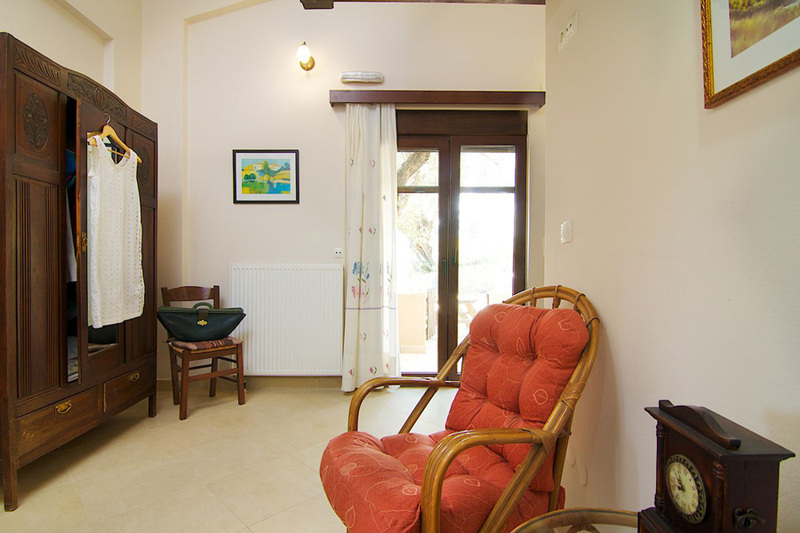 The villa has 3 air conditioned bedrooms next to the living area. The master bedroom charmingly has its double bed in the attic and hosts a sitting area and an en-suite bathroom (with bath and shower). There are also two more bedrooms each with two single beds while a sofa bed and cot is on hand if required. 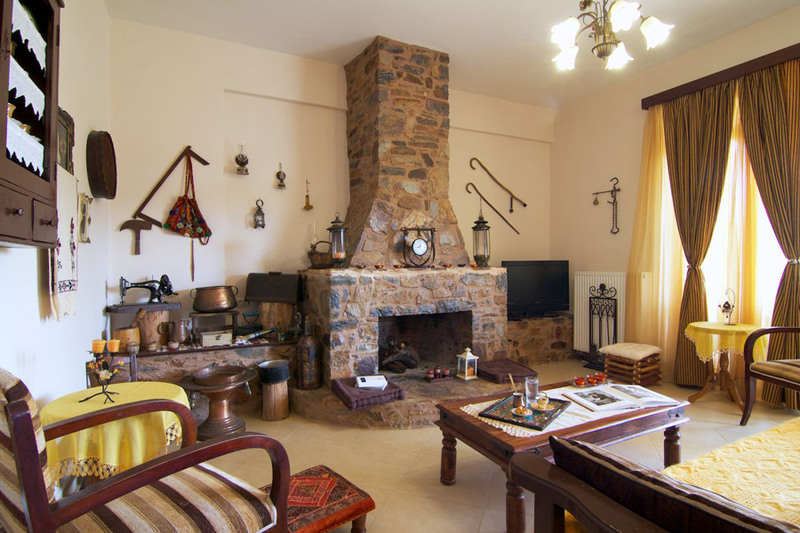 Decorated in traditional Cretan style this spacious open plan living room area with a 34” satellite HDTV and fireplace features an array of unique antiques. 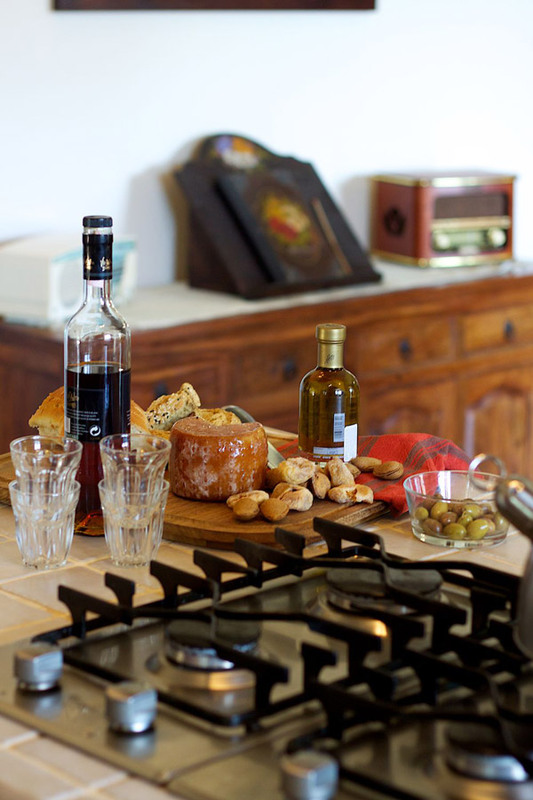 The villa has a fully equipped authentic kitchen with an indoor dining table. It contains all your necessities such as a refrigerator, oven, microwave, dishwasher, toaster and filter coffee machine besides dishes and utensils for more than 8 people. 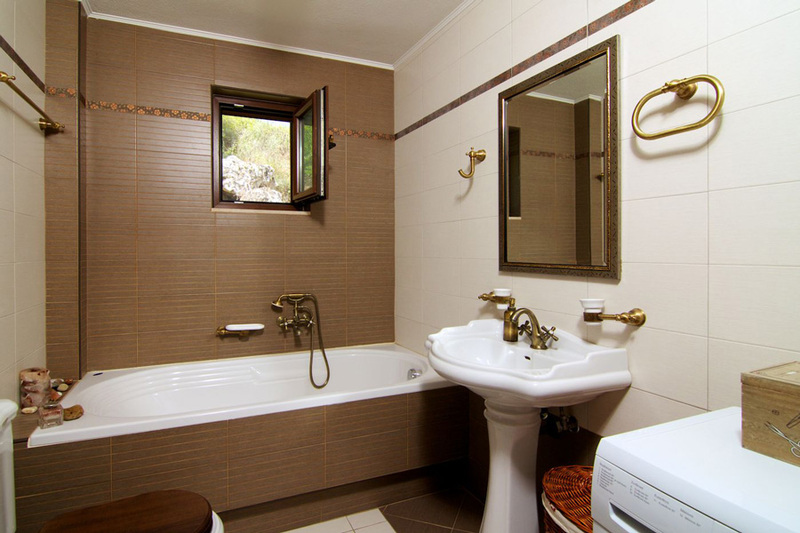 There are two bathrooms and one separate toilet in the villa. One bathroom found in the master bedroom is an en-suite bathroom with shower and WC while the main bathroom has a bath tub with shower, WC and washing machine. The outside toilet is accessible from the pool area. Fully equipped barbecue area next to outdoor dining area. 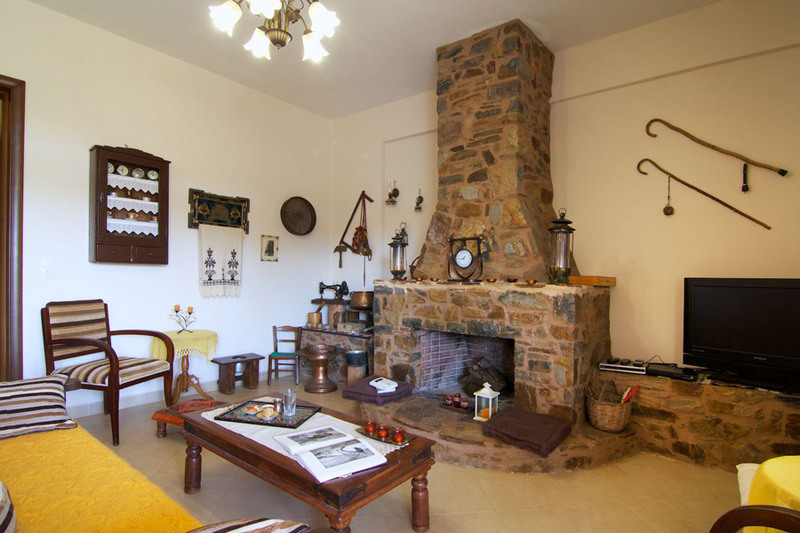 It also has a traditional wood stove and charcoal can be supplied if required. There are two dinning tables in the villa! One is in the kitchen area and the other one is on the veranda next to barbecue and the kitchen! There is a parking space for 2 cars! 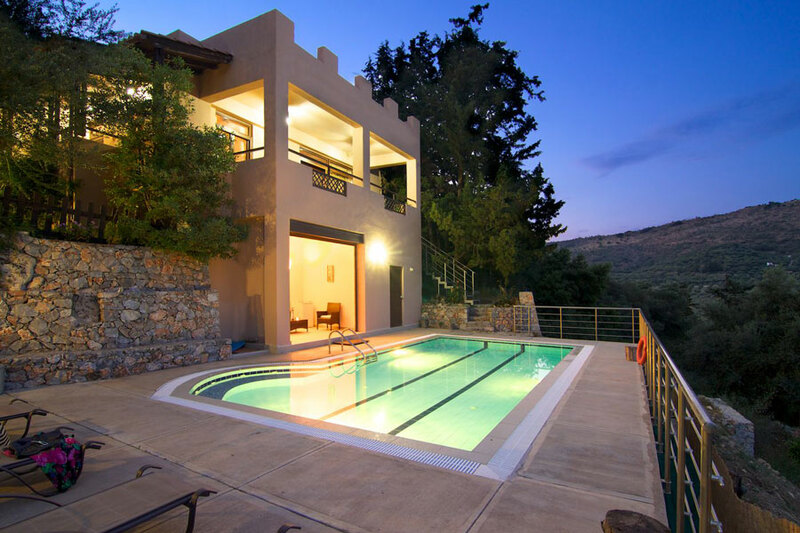 Villa Kalamitsi is a 115 sq.m villa located on a hill and situated in a privately fenced 2000 sq.m forest. 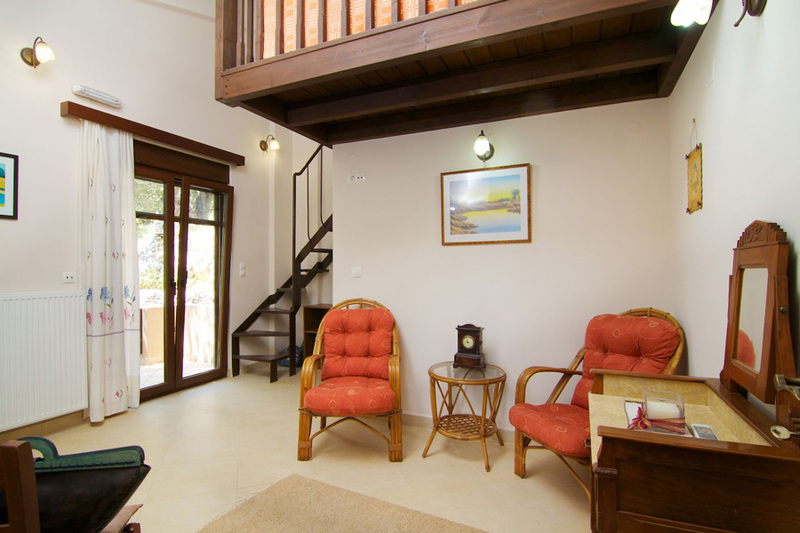 Ideal for people who want to relax to the sound of the nature while also being close to the beach and residential areas. 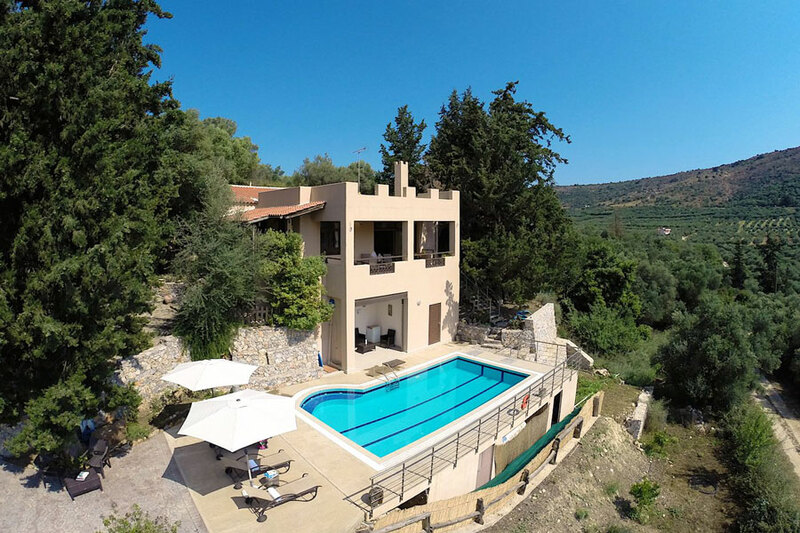 The villa which is decorated in a traditional Cretan style can accommodate 6 people in beds and a maximum 7 people if necessary. 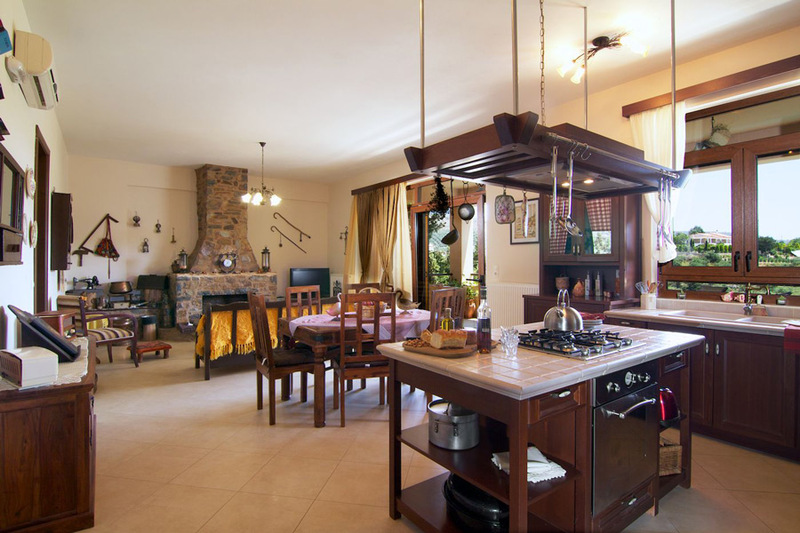 On entrance to the villa you will find a spacious open plan area with a fully equipped authentic kitchen, the living room area with satellite HDTV and the indoor dining table! 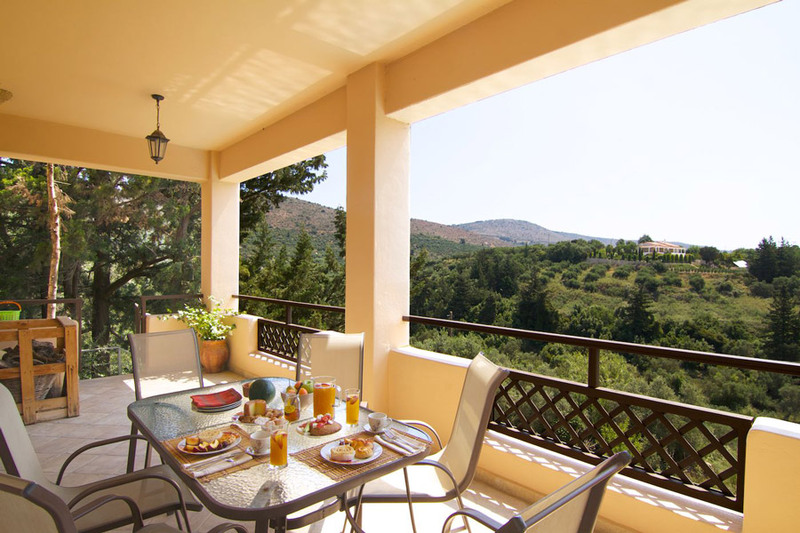 From the living room area, you have direct access to the balcony which offers great views of the landscape. 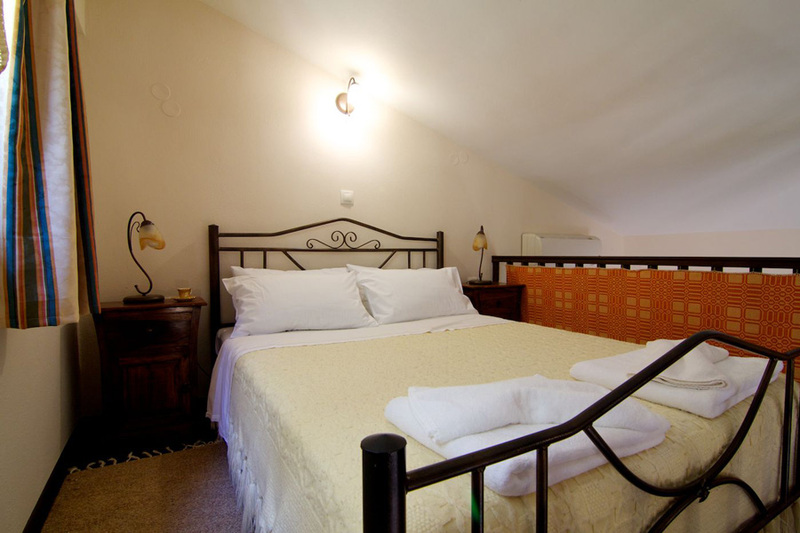 The main bedroom which hosts a sitting area and an en-suite bathroom with shower has a double bed in the attic! Also there are two more bedrooms both with two single beds and the main bathroom with bath! 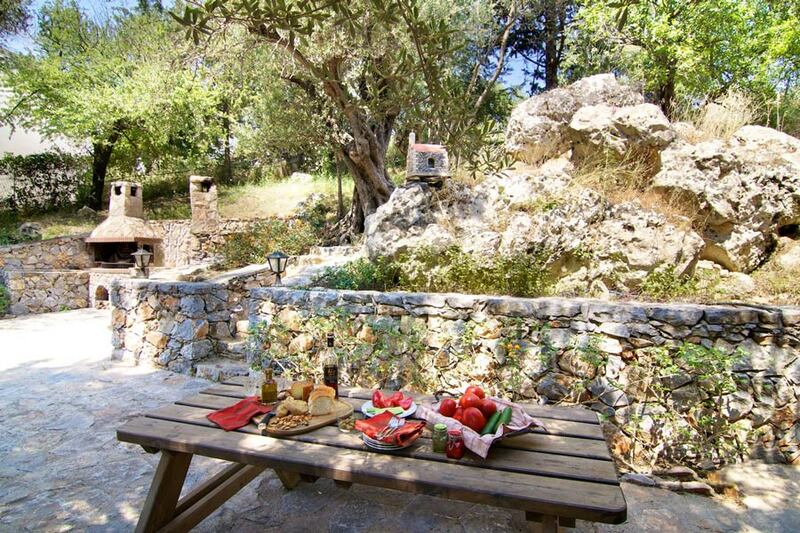 On the upper level and at the rear of the villa you will find a barbecue area under the trees, a vegetable garden, sitting areas in the forest and a children's playground with grass. 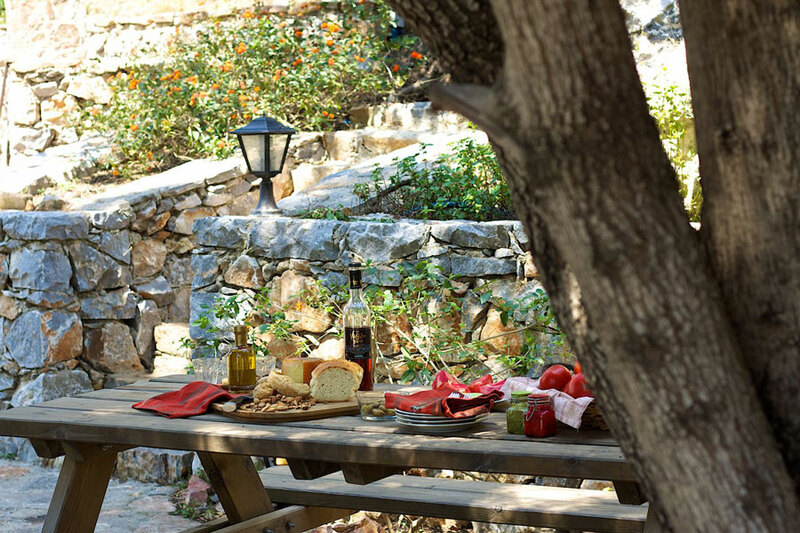 The barbecue is fully equipped containing a wood stove and an outdoor dinning table! On the lower level there is a 40 sq. m. pool with sun beds and another sitting area with a small fridge and a toilet. 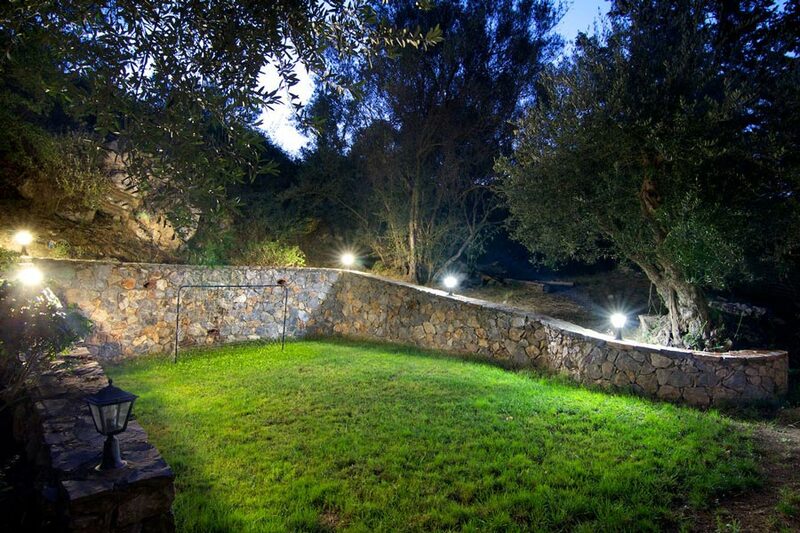 The whole outdoors area is completely fenced, offering 100% privacy to our guests! 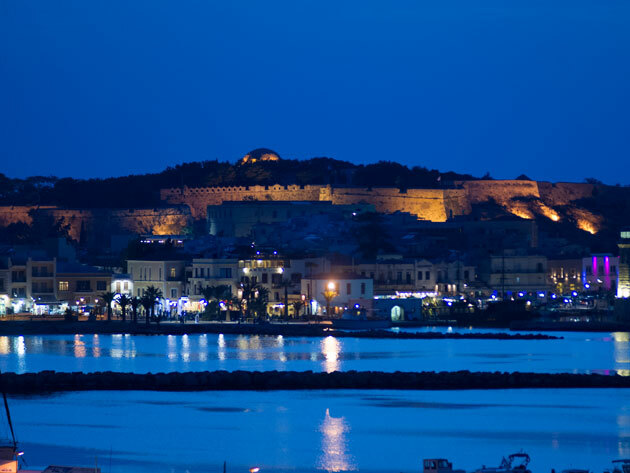 Press here to get directions from Rethymno city to Villa Kalamitsi. 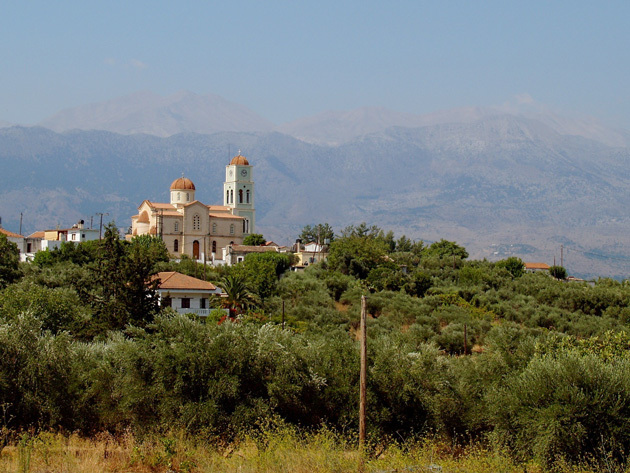 Press here to get directions from Chania city to Villa Kalamitsi. Press here to get directions from Chania Airport to Villa Kalamitsi. Press here to get directions from Heraklion Airport to Villa Kalamitsi. 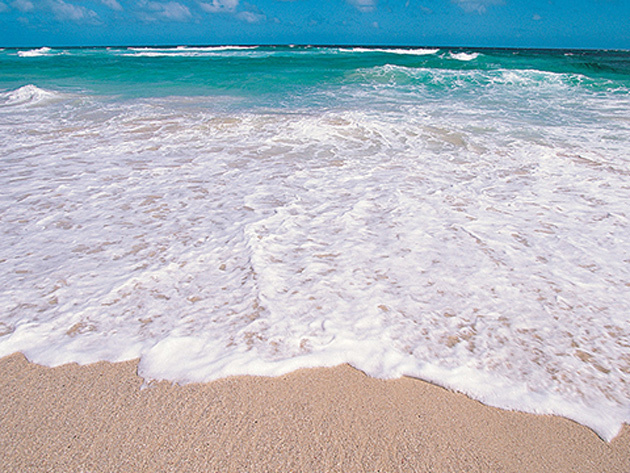 The closest beach to the villa is the sandy beach of Georgioupolis. Press here to get directions from Villa Kalamitsi to Georgioupolis. 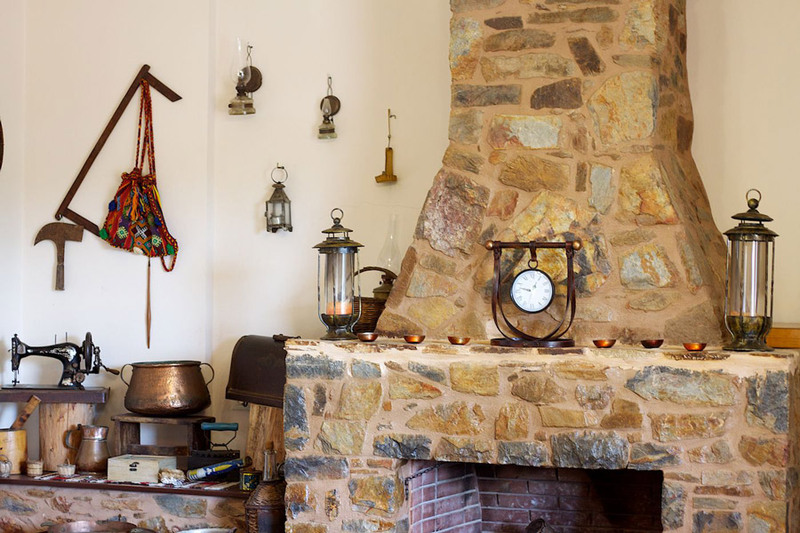 “Thimari restaurant” in Exopoli village. 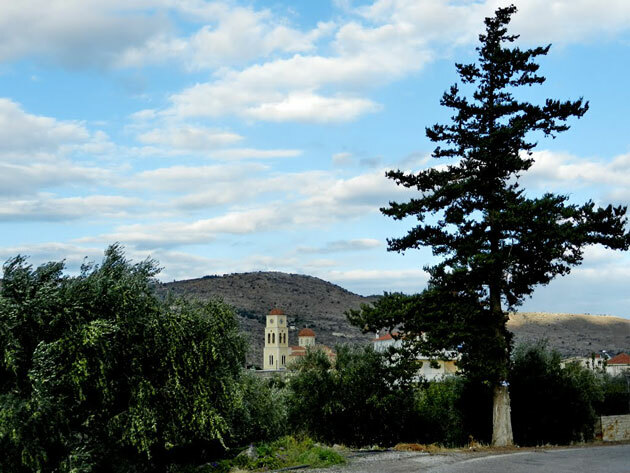 The closest supermarket is in Georgioupolis village. 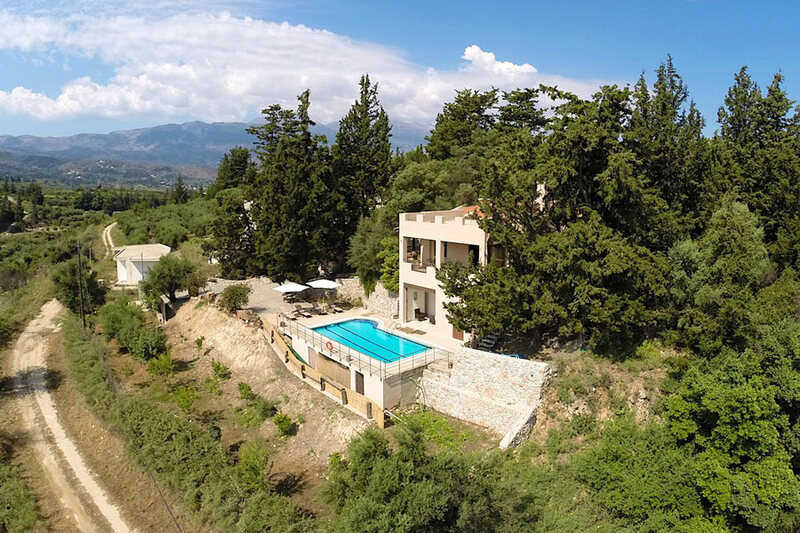 The villa is located near to “Kalamitsi Aleksandrou”, a small village on the borders of Chania and Rethymno close to the quaint village of Georgioupolis. 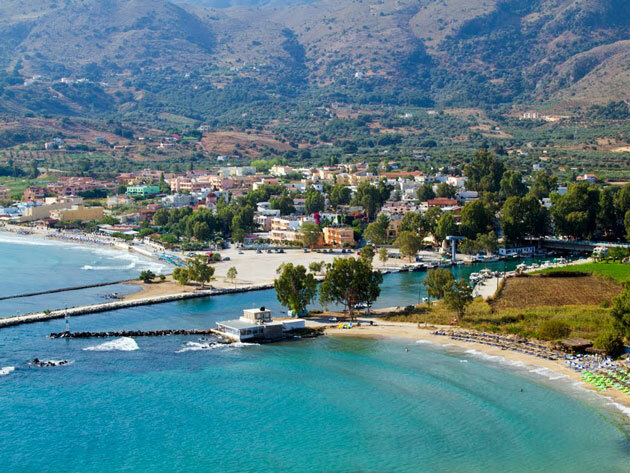 With one of the best sandy beaches in North Crete Georgioupolis offers a variety of shops, supermarkets, cafes, beach bars and restaurants and it is only 5 minutes drive away from the villa! 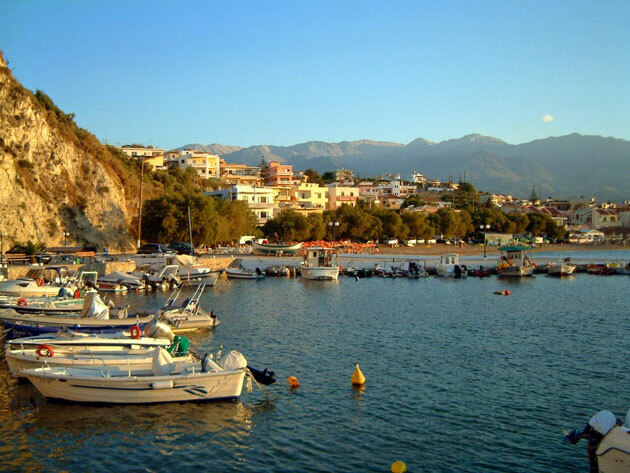 Another area close to the villa that is well worth a visit is Kalives village just 10 minutes away and besides being known for its sandy beach and numerous hotels and markets you will be able to find everything you might need! The area around the villa is totally engulfed by natures tranquility therefore ideal for relaxing but close to everything by car. 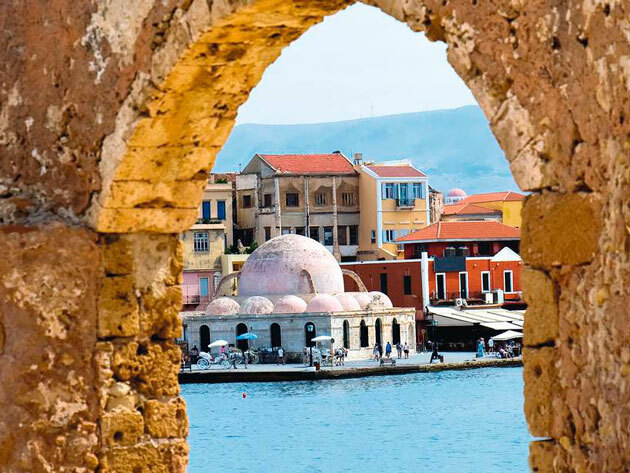 It is a superb location for those wishing to visit the North coast beaches in both Rethymno and Chania and the towns of Chania which is 34 km away and Rethymno 31 km away. Car hire is highly recommended! 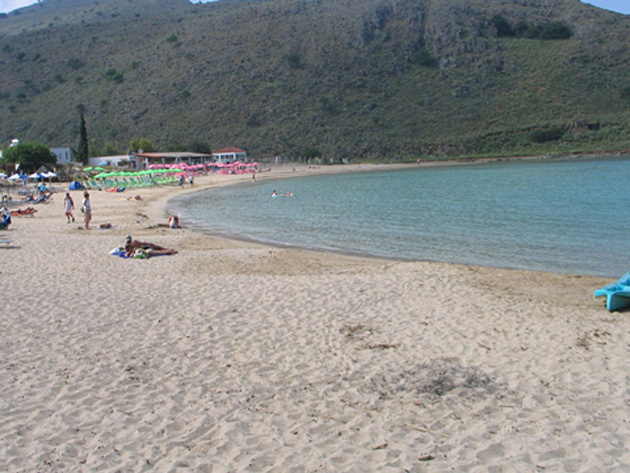 The long sandy beach of Georgioupoli which is 7 km from the villa. 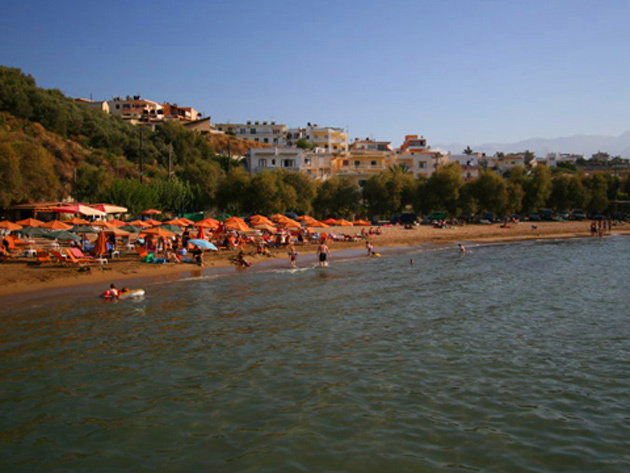 The sandy beach of Kalives village on your way to Chania which is 12 km away. 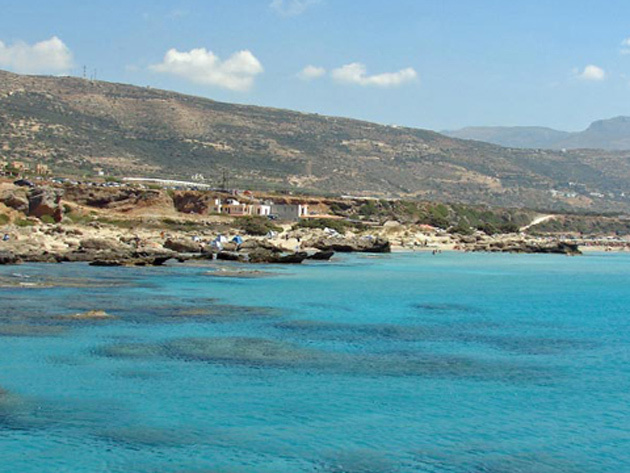 The sandy beach of Episkopi village which is 14 km away on your way to Rethymno and just a few kilometres further on Rethymno beach itself, which is a cosmopolitan organized beach stretching 18 km with many water sports. 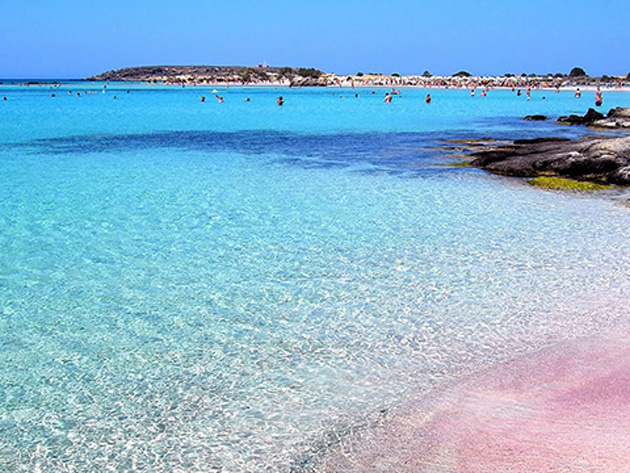 Alternatively Chania's famous beaches Platanias, Agia Marina, Gramvoussa, Balos, Falasserna and Elafonissi will not be a disappointment!